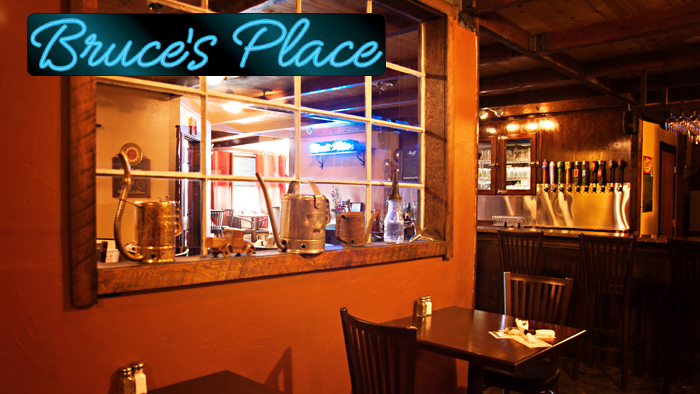 Come join your friends and make new ones at Ellensburg’s favorite new pub, Bruce’s Place. As an extension of Ellensburg Pasta Company*, we feature a full line of craft and domestic beers as well as spirits and various wines for your enjoyment. If you’re hungry, you can order from either our special bar menu or from the Ellensburg Pasta Company menus. And for sports fans, we have multiple TVs throughout the bar so you can watch your favorite teams. What are you waiting for? Your friends are already here! *Note: Bruce’s Place stays open Friday and Saturday nights until 10p.m., an hour later than Ellensburg Pasta Company. Fresh jalapeños stuffed with cheddar and cream cheese, wrapped in smokey bacon, and served with cranberry jam. Slow smoked pork ribs, dipped in our tempura beer batter, fried and tossed in a sweet tangy barbecue sauce, served with fries. 4 mini corn tortillas, tempura battered cod, white cheddar, lettuce, pico de gallo, cilantro and a wedge of lime. Drizzled with chipotle aioli. 1/3-pound angus beef, bacon, canadian bacon, cheddar cheese, green chiles, fried egg, BBQ glaze, burger sauce, lettuce and tomato. Served with fries. Dumplings stuffed with pork and vegetables, with our own honey sesame sauce. 3 pieces of hand dipped, beer battered Alaskan cod, fries, and homemade tartar sauce. French bread stuffed with provolone cheese, garlic butter and italian seasonings served with marinara. Pepperoni, meatballs, Italian hot links, salami, marinara and mozzarella. Steak, creamy gorgonzola sauce, mozzarella cheese, sundried tomatoes, mushrooms, and balsamic glaze. Bone in wings tossed in your choice of whiskey BBQ glaze or a spicy buffalo sauce. Ask your server about our 15 rotating tap handles that include featured beers, seasonal brews, and our nitro tap!